Cover your cutie's tootsies with hugs and kisses with these adorable booties, stitched with Xs and Os. 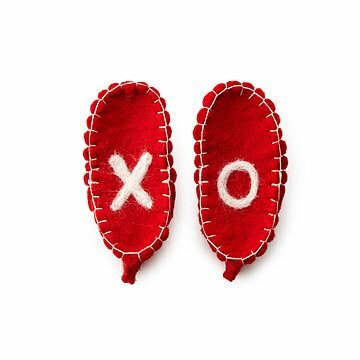 Cover your cutie's tootsies with hugs and kisses with these adorable booties stitched with X's and O's. Whether you'd like to dress up your babe for his or her first Valentine's Day or you’d like to show your love the other 364 days of the year, these booties hit the spot. Handmade by Jen List & Stacy Waddington in Illinois. Jennifer & Stacy met as preschool room mothers, sharing a love of children & artistic expression. With backgrounds in graphic arts & fashion merchandising, they were always looking for ways to share their creativity -- beyond the 4-year old audience -- and before long, seven smooches was born. Working with little more than a sewing machine & bags of unwanted wool sweaters, the gorgeous tiny cardigans, hats, mittens & kimonos came to be. Upon the discovery of needle felting, cotton blankets were adorned with felty little animals & stars and beautiful handmade wool felt emerged as warm, comfy slippers.